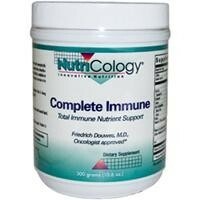 "Complete Immune is a unique blend of nutrients and herbs designed to work synergistically to support immune system function, decrease oxidative damage, promote liver detoxification and regulate cell division. This proprietary blend of nutrients and herbs is available at a fraction of the cost of all of these nutrients taken separately and is easy to use due to its availability in powder rather than capsule form." Complete immune is approved and prescribed by oncologist Dr. Friedrich Douwes, M.D., whose integrative cancer treatment center in Germany treats thousands of cancer patients every year.